The non-profit organisation Espoirs d’enfants has set up a drop-in refuge for children forced to work in the market of Parakou in central Benin. Saur Solidarités is supporting the organisation with this project. The Saur Solidarités endowment fund supports the work being done by the non-profit organisation Espoirs d’enfants in helping and supporting the very large numbers of children hired out to work in the markets of Benin (see inset). This particular project is located in Parakou, one of the main towns in the centre of this country, which is among the poorest nations of West Africa. It focuses on the creation and coordination of a drop-in refuge known simply as the shed, where these children can rest during their working day. “The vast majority of them are girls who, from the age of five, are hired out to market traders – often referred to as ‘tutors’ – in order to sell their wares”, explains the organisation’s Chairperson Isabelle Legendre. “95% of of them do not attend school and receive no education whatsoever. Following on from our initial successful experience in the market at Cotonou, we wanted to duplicate the shed initiative in Parakou”. The support provided by Saur Solidarités facilitates the overall running of the Parakou shed, which has been open from Monday to Friday every week since October 2016. It is helping Espoirs d’enfants to develop – and ensure the long-term future – of a series of initiatives designed to help and support girls who are free to visit the drop-in refuge at any time. So since the start of this year, they have been offered an in-school and out-of-school programme of education that includes literacy, cookery, sewing and other classes, as well as awareness information about health issues and the basics of preventive healthcare, hygiene and sexual health. The shed staff also reach out to the ‘tutors’ to raise their awareness of the rights of children. “The overall budget awarded by Saur Solidarités also allows us to pay the team recruited locally to deliver this support”, continues Isabelle Legendre. “The team includes a coordinator, a primary school teacher and a psychologist”. All of them are totally involved in their mission, and no fewer than 80 children are already using the Parakou shed every day. The desire and determination to improve the daily lives of children, socialise them and provide them with the help they need to support themselves long term are a perfect fit with the goals of Saur Solidarités. It has also convinced Jean-François Gaudin, the Western Regional Manager for Water Infrastructure Services at Saur subsidiary Valbé, to sponsor Espoirs d’enfants and bring it to the attention of the Saur endowment fund. “I met the organisation three years ago at an event in Rennes”,, he recalls. “When I visited its stand, I was immediately impressed by the commitment of its people, their dynamic energy, their dependability and the serious need for the initiatives they run. It was clear that donations really were used directly to fund its projects”. From there, putting together a proposal and submitting it to Saur Solidarités as the basis for action was only a short step. It was a step that Jean-François Gaudin took last autumn, and which is already benefiting children forced to work in the Parakou market. The placement of children from poor families with better-off families who can provide them with a good education is a traditional practice in many West African countries. But little by little, this custom has been subverted to become nothing less than child trafficking, with the children involved being forced to work 10-12 hours every day, virtually every day of the week. 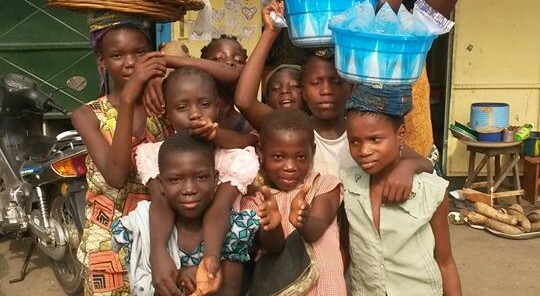 A Unicef study comes to the conclusion that there are around half a million so-called vidomégon (entrusted) child victims of this trafficking trade in Benin: they are typically aged between 5 and 14, and 86% of them are girls. The presence of Espoirs d’enfants in the markets of Benin was the subject of a Sept à Huit special report screened on French TV channel TF1. But the projects now in place are not limited solely to the creation of sheds for vidomégons. The organisation also funds other local development initiatives in Benin, Madagascar and Haiti. These focus on food security (cattle and poultry farming, agricultural cooperatives, etc. ), work on social integration of young people through sport, schooling, and other issues.